Waking up with stomach pain is not a pleasant thing. It will just make you start the day on the wrong foot. Stomach pain may feel like a bloating, burning sensation, sometimes accompanied by nausea. There are many possible causes which can make your stomach hurt. Sometimes, you need to see the doctor to determine the problem. A presence of mucus in the stool, etc. The presence of gas can also be the culprit. Luckily, the gas buildup will fade quickly once you wake up and start performing daily tasks. Normally, while sleeping the gastrointestinal system continues working. However, if you eat wrong things during the day or have bad digestion, gas can build up over the night, causing stomach pain in the morning. Make sure to eat dinner a couple of hours before you go to sleep. Why does my stomach hurt in the morning? It can be caused by the digestive problems. Celiac disease is characterized by the inability to digest the gluten normally found in grains. It can cause stomach pain if you involve gluten in your diet. Lactose intolerance is characterized by the inability or difficulties digesting dairy products. When Should the Stomach Pain Be a Concern? If you experience one or more of the following symptoms, you should seek medical help. Feeling of abdominal injuries, etc. Abdominal pain while pregnant, etc. After the answer to "why does my stomach hurt in the morning?" here are some effective remedies to help you relieve the problem. Certain types of food can help you relieve abdominal pain. Yogurt – As bad digestion is one of the causes of stomach pain, yogurt can help your digestion start moving again. Mix Greek yogurt with a little bit of honey; you will soon get rid of your abdominal discomfort and pain in the morning. You can consume it regularly in breakfast. Bananas – They are a great food when trying to ease stomach pain. Bananas are rich in potassium which helps calm down the irritated stomach. Milk Toast – These two ingredients when combined together will help ease the stomach pain and discomfort. Making milk toasts is easy. Warm up one cup of milk and pour it in a bowl. Toast one piece of bread and put a little bit of unsalted butter on top of it. Crumble the toast in hot milk and eat it slowly. Your stomach pain will ease soon. Applesauce – This is a starchy food with low acidity. It is a great food when you have an upset stomach. It is also high in fiber so you can consume it regularly for a good bowel movement. In cases of diarrhea, applesauce will reduce your symptom. CRAP Diet – CRAP is an abbreviation for cherries, raisins, apricots, and prunes. The diet is very rich in fiber, easing stomach pain. Starchy Foods – Starchy foods like potato, rice, or oats can help you calm down your stomach when it hurts. These foods don’t stay for a long period of time in your stomach, so they do not stimulate gastric reflux. Why does my stomach hurt in the morning? It has been answered. Read on and learn about some drinks that will help you relieve stomach pain. 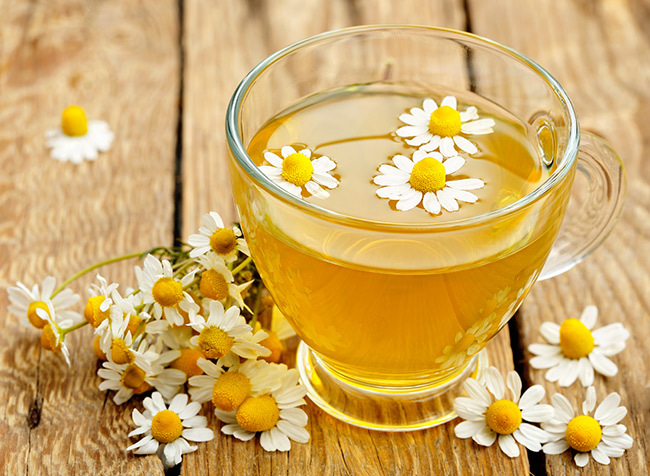 Chamomile Tea – The tea is great for soothing your stomach. It helps reduce the inflammation, as well as relax the abdominal muscles, relieving the pain. Ginger Tea – Ginger tea is a great thing to calm your upset stomach. It promotes the release of certain enzymes which will help neutralize the stomach acid. You can also eat ginger instead of having a ginger tea. Apple Cider Vinegar – Apple cider vinegar drinks will also help reduce abdominal cramps and indigestion. Water – If you wake up with stomach pain, it can mean that you are just thirsty. Keep yourself well hydrated and consume plenty of water daily. Use Heat – Bottles filled with warm water or heating pads can help you relieve stomach pain. Lie flat on your back and place the bottle or the pad across your stomach. Heat will increase the blood flow to your skin, relieving the abdominal pain. Release Any Anxiety – Stress, nervousness, and anxiety can lead to stomach pain. Try to get some good night sleep and eliminate stress as much as possible. Meditation and even deep breathing are good methods to release anxiety and tension. Stretch Your Back and Neck – You might feel abdominal pain due to muscle tightness all over your body. Try to stretch your back and your neck with regular exercises. Diarrhea in the Morning: Why Does It Occur Everyday?